One of the earliest known works by this artist is The Virgin and Child with Angels in the Musée du Louvre, which was formerly in the collection of Lord Wimbourne. 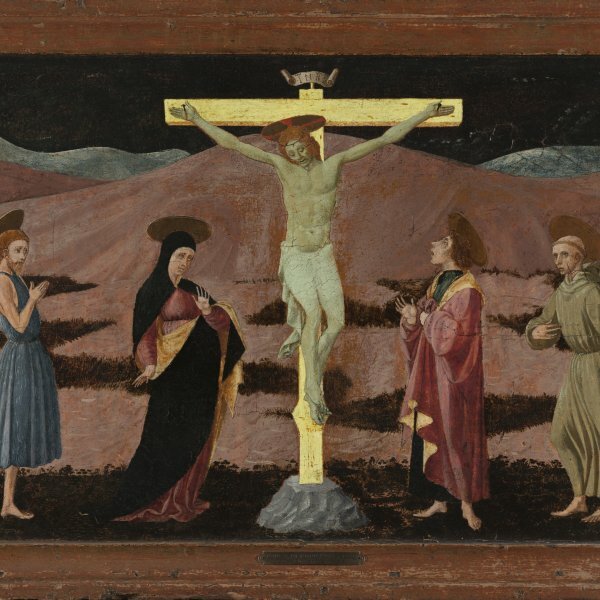 Dated around 1455, it has an inscription that relates to the first known information regarding Zoppo when the twenty-three-year-old artist was in Padua in the workshop of Francesco Squarcione. Nothing is known about his training prior to working with Squarcione, although he may have initially trained in Bologna, close to where he was born. Zoppo is documented in Bologna in 1461 and in Venice in the late 1460s. In 1471 he executed one of his finest works: the altarpiece for the church of San Giovanni Battista in Pesaro, whose central panel (now in Berlin) depicts the Virgin and Child surrounded by saints. Zoppo’s style combines elements deriving from Venetian and Paduan painting with others of Bolognese origin. Thus we find echoes of artists such as Mantegna, particularly with regard to draughtsmanship, and of late Giovanni Bellini. 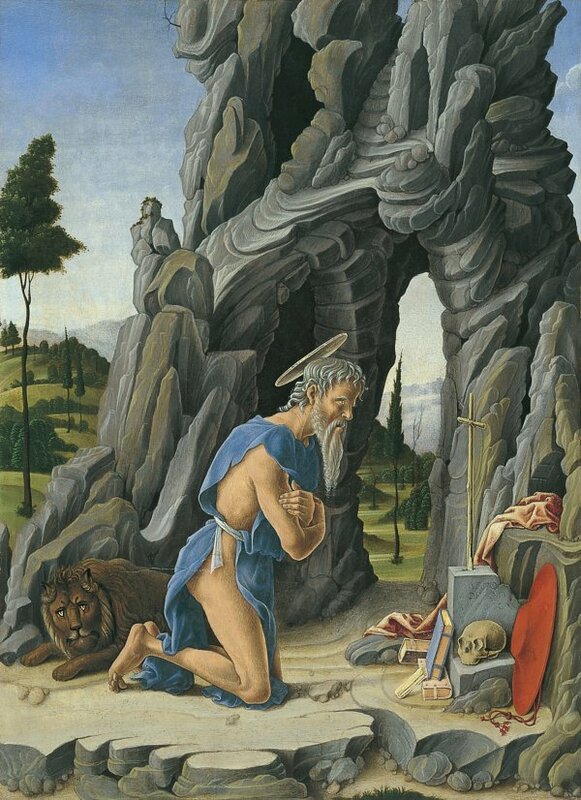 Since it was first mentioned in the literature, Saint Jerome in the Desert has been considered an autograph work. Pallucchini dated it to around 1471 and suggested that it was one of the panels in the predella of the painting now in Berlin, painted for the church in Pesaro. Eberhard Rummer, however, dated the painting to around the first half of the 1450s and emphasised the similarities of technique and style with The dead Christ between Saint Jerome and Saint John the Baptist in the National Gallery, London. Zoppo depicts his penitent saint in a moment of meditation, kneeling before the cross. He can be identified by his traditional attributes of the lion, lying on the ground, the books and above all the cardinal’s hat. The painting is executed with firm lines that are particularly evident in the careful rendering of the rocks in the middle-ground in which some of the stones have fantastical shapes. This use of a powerful line is softened through the reduced colour range that nonetheless gives unity to the whole composition and in which greys, blues and greens predominate. Zoppo only uses a bright crimson for the cardinal’s hat and a paler red for other personal objects. Contrasting with the harsh setting of the rocks, the artist depicts a gentle landscape of pleasant greens and soft forms that acts as the background to the scene. The figure of the saint conforms to the artist’s highly individual style, particularly in details such as Jerome’s ample, pointed beard with its broad, waving curls and the hair, which is created from small clusters of ringlets. The Pinacoteca Nazionale in Bologna has another Saint Jerome by Zoppo that repeats various elements found in the present panel, such as the rocks, which are located in the centre of the Bologna panel, the religious texts and the attributes. Zoppo also returned to this subject, but using a horizontal format, in the predella for the altar of the church of San Clemente of the Colegio de España in Bologna.